Koalas look cute and furry in photos, but if you touch one you’ll find that the fur is quite coarse and even unpleasant to touch. They also have sharp teeth and claws. Cath is participating in a koala survey on her property in Ashby. In my area (around Lismore), the main trees that koalas love are the tallowwood (Eucalyptus microcorys) and forest red gum (E. tereticornis). Down south in Ashby, where there the climate is drier and the forest type is dry sclerophyll rather than wet sclerophyll or rainforest, there are no tallowwoods, they are up the grey gum (E. punctata). 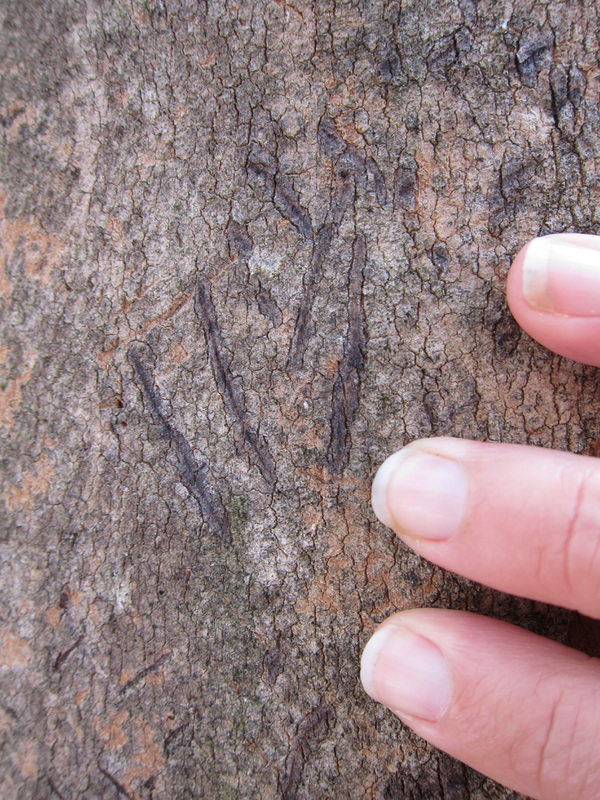 It didn’t occur to me that, of course, those sharp little claws would make identifiable marks in bark. 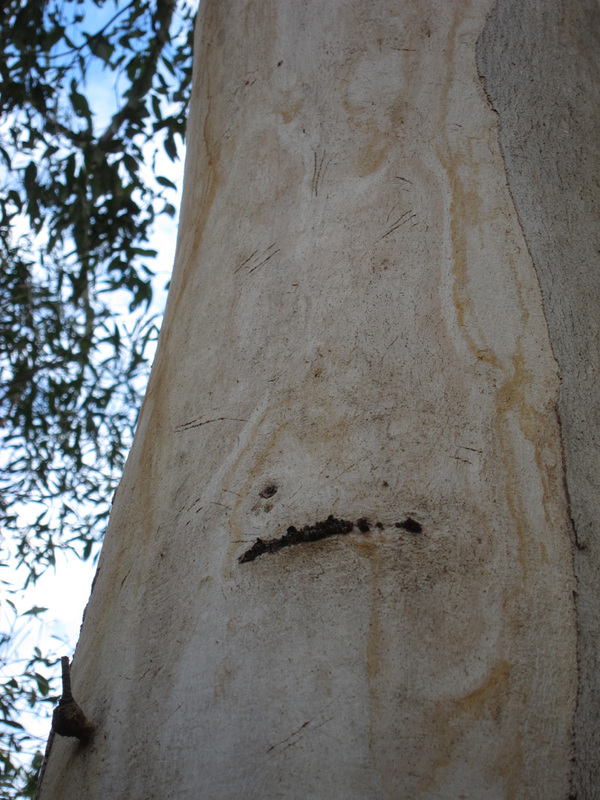 Goannas also mark trees when they climb them, but koala marks look different. The grey gum in the shot below has lost its bark. The tree below still has its bark. Here’s a shot showing the actual size of the scratches. 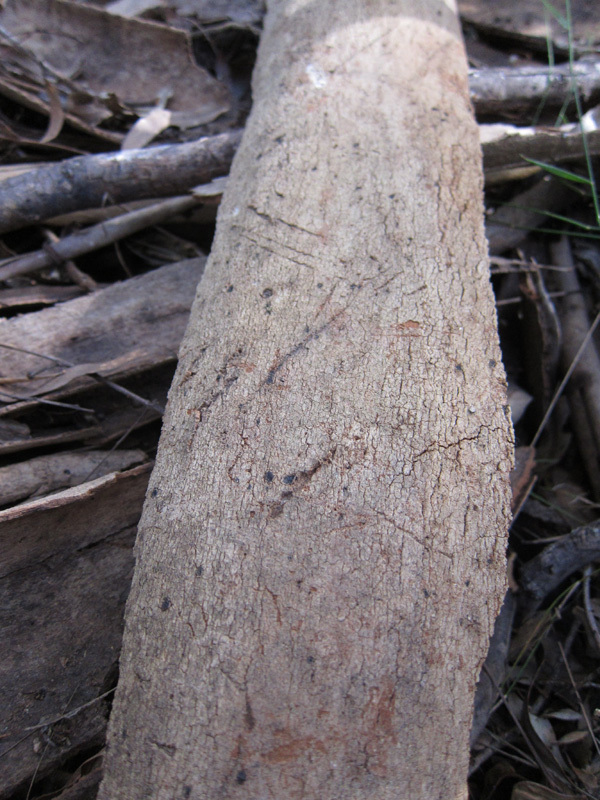 The claw marks have been coloured in certain trees, for revisiting the site. Cath’s property is in core koala habitat, and the local shire council is developing a koala management plan. 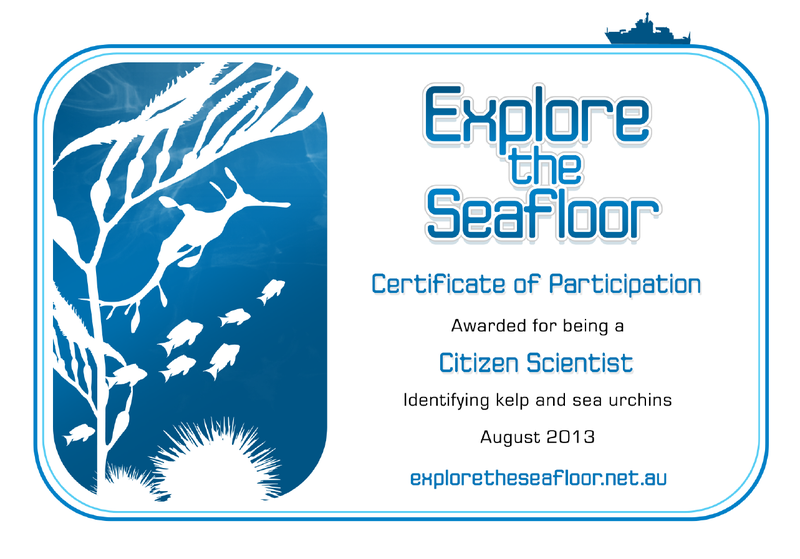 Studies like these will gather information important to koala conservation. This entry was posted in Animals on land and tagged Koalas. Bookmark the permalink. Cath was really thrilled when she saw her first koala on her property, and continues to be so whenever she sees them. Me, too! The thrill went off the scale when one actually came calling (see my previous post “Koalas – up close and personal”). I often hear a male when he is calling for mates in the spring (like a giant donkey braying, echoing down the valley – it’s an amazing sound). Those koala stuffed toys are actually made of kangaroo skin, which is nice and soft. 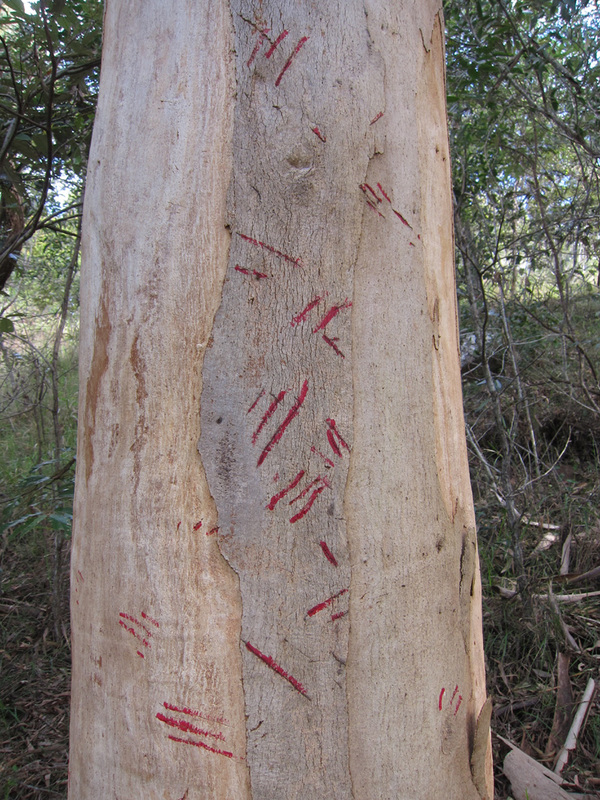 The red claw marks are not “tree-art,” but my experiment to monitor “K-1”, the grey gum nearest my house. I used red nail polish to show existing marks, so that any new ones will show up separately. It’s lasted 8 weeks thus far. If I can learn to sleep with my windows open a bit, I’ll likely hear them, but for years have kept a blower running as “white noise.” Can’t even hear a helicopter when it’s going.